RALEIGH, N.C. – After encouraging others to support charities and causes they believe in strongly during a keynote speech at North Carolina State University, Andy Albright backed up his words with a major donation to his alma mater. 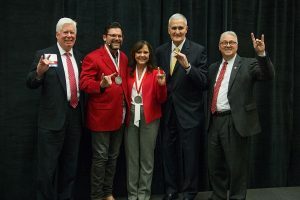 Albright, a 1986 graduate of the College of Textiles, along with his wife, Jane, announced a $5 million gift to the N.C. State Entrepreneurship Initiative and the General H. Hugh Shelton Leadership Center, Chancellor Randy Woodson announced on Friday. The Albrights made the announcement with Woodson, General Shelton and Tom Miller, senior vice provost for academic outreach and entrepreneurship and executive director of N.C. State Entrepreneurship Initiative, during the 15th annual Shelton Leadership Forum at the McKimmon Center. Albright, the co-founder, president and CEO of National Agents Alliance, said the gift was an investment in the future of N.C. State and the students, who will become job creators in the future. 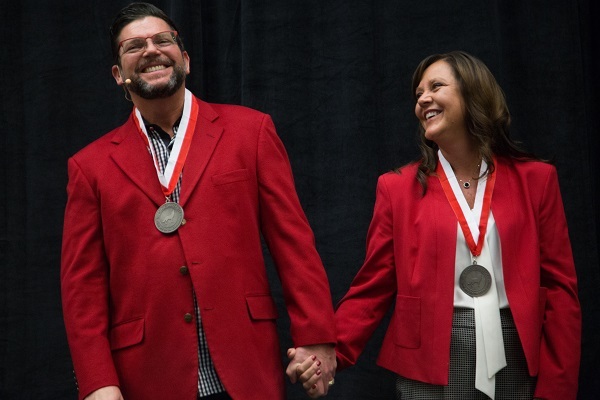 In honor of the Albrights’ gift, Innovation Hall – which opened on Centennial Campus in 2014 – will be named the Andy and Jane Albright Innovation Hall. One area of the Albrights’ gift is an endowment for the Albright Entrepreneurs Village, which the Albrights previously established with a $500,000 gift. Additionally, the Albrights are creating the Shelton-Albright Entrepreneurial Leadership Youth Program, which will partner the Entrepreneurship Initiative and the Shelton Leadership Center. The generous gift also signals a major upgrade for the Shelton Leadership Center, which will move from its current space in the McKimmon Center to Valley Hall on Centennial Campus beside of the Albright Innovation Hall. This will give the center more space to hold workshops and offer courses. In October, N.C. State launched the public phase of the “Think and Do the Extraordinary Campaign,” the most ambitious fundraising effort in N.C. State’s history. The campaign has committed more than $1 billion toward a goal of $1.6 billion by the end of 2021. Woodson said the Albrights pushed N.C. State past the $1 billion mark. The Albrights’ gift supports all five of the campaign’s priorities – leadership, experience, purpose, places and opportunity. Albright said leading by example – in anything – is the best way to show other people what is possible and what can be done if you are committed and believe in what you doing.